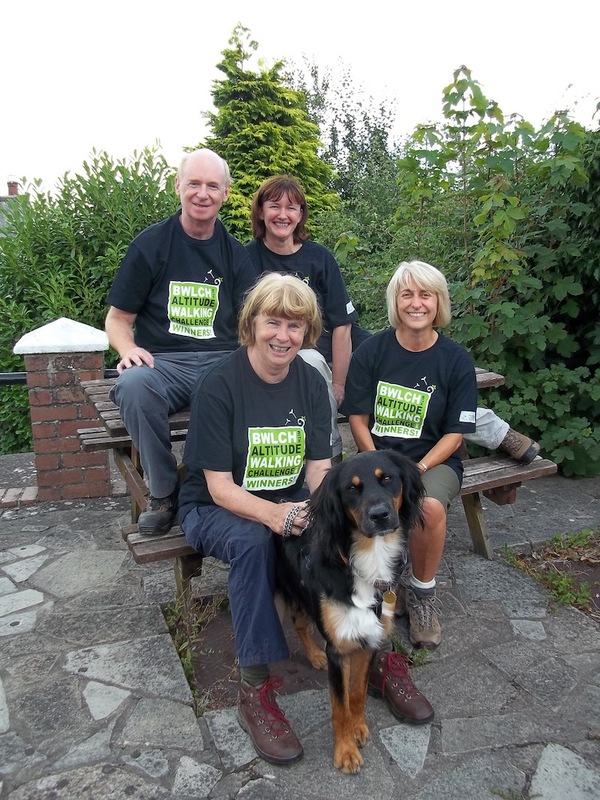 Bwlch With Altitude Challenge – Teams rise to the occasion! Whilst many of us enjoy a leisurely Saturday morning stroll after a long week at work, spare a thought for those hardy souls who took part in the recent Bwlch With Altitude Challenge. Setting off at equidistant but opposite sides of Llangorse lake, our 17 teams of 4 people – not forgetting Geli the dog started their 12 mile walk around the lake from Bwlch and Llangorse respectively, seeking out clues and answers to a number of questions set as part of the challenge’s photographic quiz. Whilst there was, undoubtedly, some tired and aching feet at the end of the journey, the breathtaking views and glorious sunshine made it all worthwhile. And if any further motivation was required, cheques to the sum of £100 awaited the two winning teams to donate to a charity of their choice. First to cross the line from Bwlch were ‘Last year’s winners’ – yes they really are called ‘Last year’s winners’ – confusing I know. So this year’s winners were, Robert Davies, Nicky Williams, Kerry Graeves, Wendy Wakelin and Geli the dog. They will be donating their winning cheque of £100 to Abergavenny Alzeimers group. The winning team from Llangorse, the ‘Whatevers’ made of up George Cochrane, Karla Lohuis, Ioan Manson and Bryn Wright arrived back for an early tea at 3.30pm. They kindly donated £50 to Motor Neurone Disease and £50 to Cancer Research. Returning at a more leisurely pace, no doubt pausing to enjoy the views along the way, the final team arrived back at 7.30pm. All those taking part in the challenge were treated to some tasty food and drink upon completing the walk. This entry was posted in Press Release on September 5, 2013 by ryant.